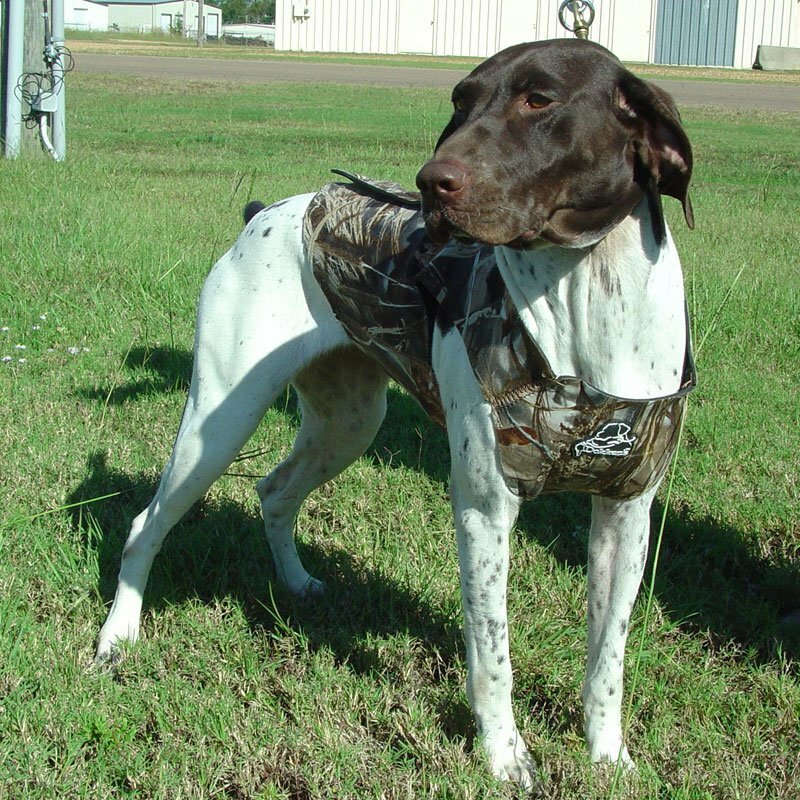 Use your vest during pre-season training and conditioning to acclimate your dog to the vest. The Dokken Supervest Xtreme is great for all hunting and training conditions. It features "SuperStretch" 3mm Neoprene construction with heavy duty nylon stitching, and a zippered closure with an extra wide velcro flange. "Provides additional warmth while waterfowl hunting. Well fit and accurately sized." 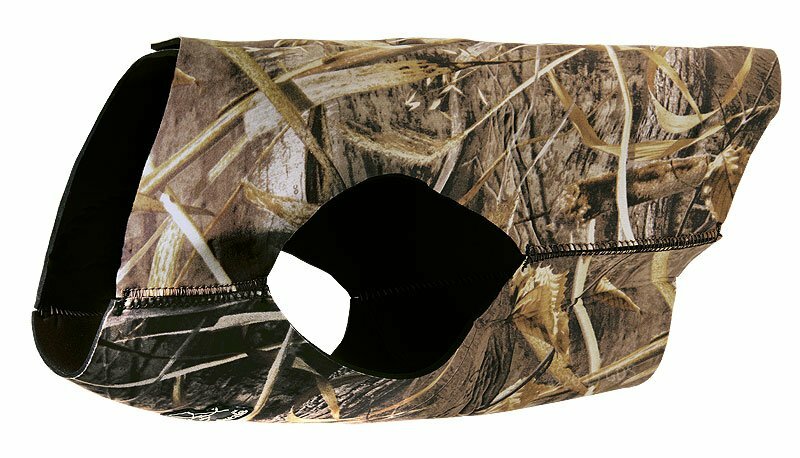 Seems well made and provides additional warmth while waterfowl hunting. Well fit and accurately sized. "Dokkens suggests in his book to use thinner neoprene to get a good snug wrap. It does exactly that. Its perfect and keeps her warm." My girl is very slender and none of the vests at Bass Pro fit her. I took a chance on Dokken's small because it was smaller than the rest. I felt confident in it because Mr. Dokkens suggests in his book to use thinner neoprene to get a good snug wrap. It does exactly that. Its perfect and keeps her warm. Thanks for having what we needed. "I really like the fact that it has a zipper and Velcro, which makes it impossible to come off till you take it off. The best vest to use if your dog is retrieving in cold weather!" "Fits well, not too bulky." Fits well, not too bulky. Great for weather in the south. "It fits our girl Freyja very well." It fits our girl Freyja very well. Sizing chart was very accurate. Already used it a few times in the field. Keeps her warm and protects her underside. Seems like it should hold up under the tough conditions. "It's durable, functional, looks nice, and is better made than any dog jacket you can get at the petstore for equal or better price!" I have gotten the XXL size one for my 90 lb Lab Pitbull mix, and it works great! He isn't a hunting dog even though he'd be a great one. Naturally quarters just ahead of you on hikes and finds doves and other birds with his great nose and flushes them out of hiding. However this is a great jacket regardless. The stitching is highly durable, and the material itself is as well. He's gone through thorn bushes and plays with other dogs and hadn't gotten so much as a scratch on the neoprene. The Velcro that attaches over the zipper is also some strong stuff and you actually have to put some force into opening. This jacket will not come off unless someone actually takes it off! Keeps him warm on colder days too as his fur is more on the pitbull side, so it's not as thick as lab's coat. For a hunting dog or any dog spending a lot of time outdoors in colder weather I would highly recommend this jacket. It's durable, functional, looks nice, and is better made than any dog jacket you can get at the petstore for equal or better price! "Thank you for the excellent merchandise and the quickness with which this gift was shipped." Thank you for the excellent merchandise and the quickness with which this gift was shipped. It arrived, and I could not be happier with the vest. "The fit was real good." The fit was real good. Took her a little to get used to having something on, but I know it kept her warmer being outside. Product was great. Service from Gun Dog Supply was almost non-existent. Product was delivered a week late, and I had to contact shipper instead of GDS. Disappointing. My 63 lb. boxer has a deep chest, so I ordered an XL to fit her chest size and it fit her better than I had expected. Good price too. Great construction. I really like the zipper and Velcro combination. "The dog knows it is time for business when the vest is on!" Overall, a nice product. I should have purchased a size smaller, but this one works great. The dog knows it is time for business when the vest is on! "It fixed my 80lb Lab perfectly." Received the vest in less than three days. Was told at least a week. It fixed my 80lb Lab perfectly. No cutting needed. It has a nice big zipper and wide Velcro for easy on and off. Awesome product. Sturdy and resistant. Fits the dog perfect. "Fits great and matches the sizing charts." Fits great and matches the sizing charts. My dog can still move well while wearing it. Great fit. Use it more for camo with a Chessi. He doesn't need it to stay warm. "Great and fast customer service." Great and fast customer service. Would buy again. Perfect for my dog. Just perfect. I wanted a 3 mm and not a 5 mm for easier swimming mobility. I highly recommend this vest. "Nice fit, fast shipping, although the stitching seems a bit weak." Nice fit, fast shipping, although the stitching seems a bit weak. I like the fit and feel of the stretchy neoprene. "I am happy with this product." I am happy with this product. Got it for our Chocolate Lab for waterfowl hunting. She is almost a year old. We measured her according to the size chart, and said the large would fit. It does fit perfectly, but I believe getting the XL would have worked just as well. She likes to strut around in it and show off her new gear. Exactly what I wanted. Not too constrictive to allow my dog to swim and run, didn't take much training for him to wear it, and it kept my dog warm on a three day river trip. "Seems to be a well made product." Received the vest in a very timely manner. My Dobie should love it. Seems to be a well made product. This product is exactly what I was looking for. A great value compared to similar products from other suppliers. You can't go wrong with this dog vest. 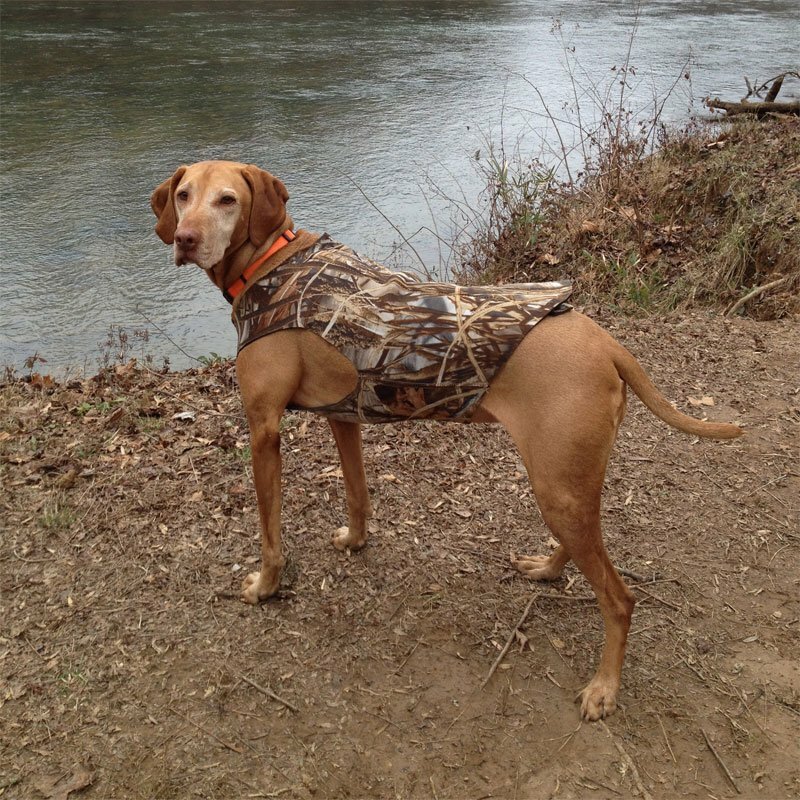 Shorthairs are tough to fit because of the large chest and narrow stomach. The vest fit perfectly, and does not bind or interfere with swimming! Our lab just turned 1 and hit the scales at 100 pounds. He is very broad and long but not fat. Went with xxxl and fit him well. Well made and he doesn't mind wearing it on cold days. I can completely be honest to say that the neoprene insulated dog vest is incredibly amazing since it is so securely attached to his body and keeps him so much warmer than without one swimming in cold water!! The camouflage design of it allows him to be camouflaged at the pond or in the field and look identical to my camouflage! Had to cut it a little under front arms, but it's a great vest. Bella loves to wear it. Works well in duck blind and during the blizzard we just had. Thanks. This is second vest we have ordered. She out grew the first one. She is big chested. lol She is also still wearing the collar we ordered. Everything has been great. Nice fit with a little trim to open up the front shoulders. True to size chart. Easy to put on/off. The neoprene on this vest is slightly thinner which gives it more flexibility. Great vest. Great product. Fit my dog well right out of the box! And got here really fast! Excellent vest. Fits correct to measurements. Easy to put on and non-interfering in the field. My setter is comfortable with it, and so am I. Great for the field and the dog. Thanks to several comments posted, I took a chance on it fitting him. This vest is cut for a more lean spaniel. Looks very well made. He may not hunt the best, but he should be comfortable/warm in this. "Durable zipper and really strong Velcro!" Fits great for our huge golden retriever. She's just starting into birds. Seems comfortable for her, and it's easy to put on. Durable zipper and really strong Velcro! Thanks Gun Dog Supply for a great product. Great product! Fits him like a glove!!! "Quality of product is great." Quality of product is great. Shipping was fast.. love the large heavy duty zipper. I may have ordered it a bit small, but it is doing the job! It does stretch a bit, so that is good. Hard to judge size online, but well worth it in quality. Awesome service. Thanks. Look forward to shopping with you guys for my bird dog. Awesome vest, and the measurements on the site made it easy to fit my dog Dixie. Myself and Dixie are very pleased with your vest. Works really well. 2XL is right on the limit, though. Dokken may need to consider a bigger size. "This vest is very well made." This vest is very well made. "Lady has worn the vest several times, and it still looks like new." It was a good fit. Easy put on and take off. It appears to be very durable. Lady has worn the vest several times, and it still looks like new. Great vest. I do wish it had more adjustment to it though. "It is working good for us." It is working good for us. "Followed the recommendations for sizing and it fit perfect!" Just what I was looking for! I was surprised that we need an xlarge for our lab under 70 lbs, but followed the recommendations for sizing and it fit perfect!! Thanks! "Kept him warm in the water for a day of duck hunting. Just what we needed." "Quick delivery. Great product. Great price." Quick delivery. Great product. Great price. "Heavy duty zipper and velco. Highly recommend." pointer/aust cattle dog. Family pet. Very good fit. Heavy duty zipper and velco. Highly recommend. Great product. Will have to return the XL as it is too small for my Weim. He was on the edge of xl and 2xl. will also have to have the neck tailored to get it to fit perfectly, but a good product. 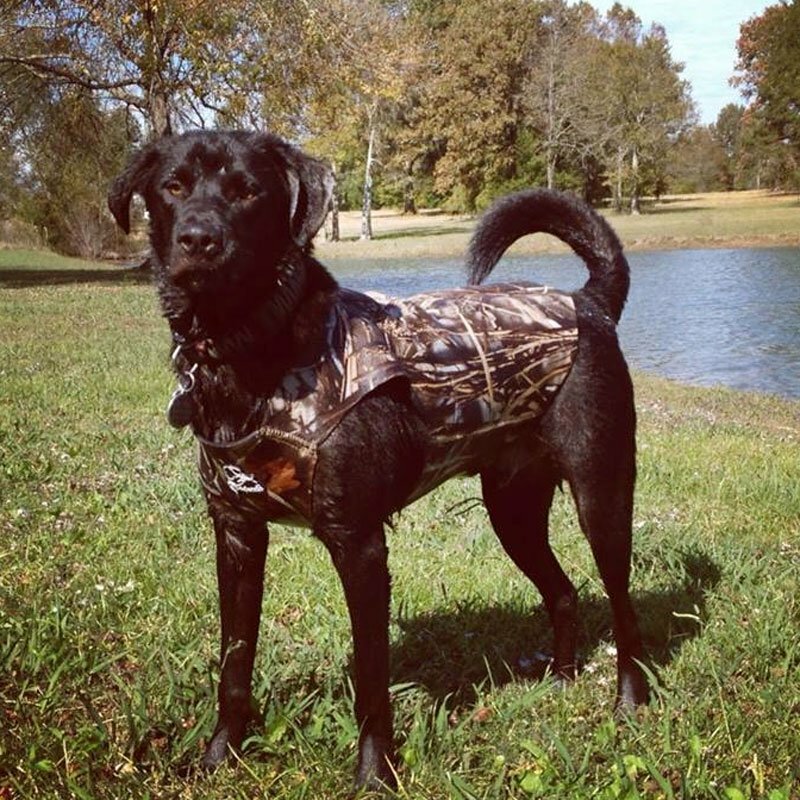 "This is the first vest I bought, and it fit my 38lb Boykin Spaniel perfectly." This is the first vest I bought, and it fit my 38lb Boykin Spaniel perfectly. Great Product! "Love the vest! It fits perfectly, and she seems to enjoy wearing it." Love the vest! It fits perfectly, and she seems to enjoy wearing it. She has been hunting three times wearing it and has obviously been able to maintain her body heat much easier and has not been as tired when she gets home. "Only took a few minutes to get used to it." Great fit. Put it on the dog, and only took a few minutes to get used to it. "I'm sure he likes it on those -30 degree days we have had in N Minnesota." Fits him great. 35-40lb dog. Small vest. Keeps him from getting scratched up in the snow and woods on that breed of dog. I'm sure he likes it on those -30 degree days we have had in N Minnesota. "Looks to be very sturdy and should work great in cold water and protection from spurs and barbed wire fences." Looks to be a great product. The measurement chart was right on. Looking forward to hunting season and will hopefully start using it in her training to acclimate her to the vest. She was a little nervous when I put it on her at first. Looks to be very sturdy and should work great in cold water and protection from spurs and barbed wire fences. "I love this vest for my dog. Now he can go in with me and not worry about thorns or other dangerous plants that can scratch him." I love this vest for my dog. It's what I've been looking for ever since we go into the woods. Now he can go in with me and not worry about thorns or other dangerous plants that can scratch him. Thanks Gun Dog Supply!!! Great vest. Fits much better around the neck than others I have seen. There is no looseness anywhere. Better vest for a better price. Fits good and does not limit her movement. "My dog vest is a little small for my dog." My dog vest is a little small for my dog. 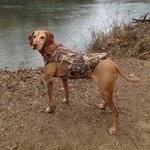 Is there any way I could send the dog vest back and get a bigger size? GDS Reply: We are exchanging the vest for a larger size. Excellent quality and value. Ordering and expedited shipping service was outstanding. "Easy to put on, and once on, it stays on." Easy to put on, and once on, it stays on. Zipper and Velcro. Fits very good. Would recommend it. It's a perfect fit...I have a 8 month old GWP...he runs on the little smaller side hes about 45 pounds and lean, its slightly too big for him, but he will grow into it. It has kept him warm so far in temps around 29-35 degrees early morning duck hunts (south dakota). Good price too. "Excellent fit and highest quality"
Excellent fit and highest quality. I don't remember my surf wetsuits being this well made. "The puppy loves it, and it looks and works great." The puppy loves it, and it looks and works great. My pup was in between small and medium. I notified Gun Dog I was ordering both and would return one. They sent a return authorization along with mailing label with vests!!!! Great service. I always go there first for my needs. I have a Boykin Spaniel that is difficult to fit, but this one works great. Seems well constructed. Haven't had it long. We'll see how it holds up. "I love the vest, and more importantly so does he." I love the vest, and more importantly so does he. I had to trim it a little on the chest going into the leg holes. But I expected that. No two dogs are the same. So far, great vest for the price. He is warm, so I am happy. Although not your typical hunting breed, my short haired friend performed unbelievably retrieving everything that dropped in water or rushes. The vest fit perfectly and provided her with warmth and protection and helped conceal her from the geese that are always spooky and aware. Great product! "certainly helped her deal with the cold a bit better"
Needed a small neoprene vest for my Boykin, as she is not equipped like her Labrador sister for the cold water. It arrived overnight as requested. Only got it use it once, but it certainly helped her deal with the cold a bit better. Duck opener my dog disappeared for 4 hours When I found her the vest was missing. Just glad I found my dog. I'm going to have to order another one cuz it's getting cold out. "This really protects the pup." We train/hunt in beaver swamps with many pointed stumps. This really protects the pup. "Hard to get good sizing for a female trial dog. 19 inch neck, 33 inch chest, 24 inch waist." Hard to get good sizing for a female trial dog. 19 inch neck, 33 inch chest, 24 inch waist. Nothing that a pair of scissors and a tube of Aquaseal can't cure though. Even the small size was bit too small for my field bred English Springer. I wish it had a handle on the top to pull my dog out of the water. Good quality product. Some stitching was defective. We had to restitch some seams, but otherwise it worked great. Seems like it will work well, given the 3 mm, my dogs wasn't impeded. Wish it had a handle on top to help getting him into the boat. Good fit. Only used it twice so far. "Vest works great for duck hunting in cold water and brush"
Vest works great for duck hunting in cold water and brush, but the zipper is a bit of a pain. I think it would be better if it was just Velcro. All dogs vary in size, and it is expected that a vest should be trimmed. Only down side with this vest is that it lacks bartacks needed for more extensive trimming. I lucked out and didn't need to trim where there was stitching. Good product for the price. "I think the Dokken vest is well made"
I think the Dokken vest is well made. It's nice that they offer a fit chart which was right on. "Fits my 43lb pointer well except for the front where it spans her chest." Fits my 43lb pointer well except for the front where it spans her chest. It has a pucker that collects seeds and twigs. I am going to stitch a few darts in the front to tighten the material laterally. It should be fine. Maybe the mfg. should consider some type of expanding fabric to allow for a snugger fit in front. "With the zipper in place, there is no way to adjust the fit for narrow necks and abdomens." With the zipper in place, there is no way to adjust the fit for narrow necks and abdomens. "Fits a little tight but works. " Fits a little tight but works. It's hard to tell right now, but the stitching looks like it may not last. "Based on the size chart it is a little small." Based on the size chart it is a little small. I will have to make sure she does not gain any more weight. "I would buy this brand again." I think it's a decent vest for the money . If the zipper holds up that's all I really care about . Getting the vest on the dog, and you have trouble with the zipper, it gets frustrating. The neoprene seems to outlast the zipper. I would buy this brand again. I think if you get a year or two out of this vest that's good and that's all I'm expecting. "Unfortunately had to alter it to fit." Unfortunately had to alter it to fit. Not necessarily anyone's fault. Snug in midsection, loose in front. It's a nice vest, especially for the price. "The stitching looks like it might unravel in time." It's difficult to get a vest that fits the deep chested/slim dog like my Setter. This is a pretty good fit for him. I'd give a five star rating but I'm not sure on the durability. The stitching looks like it might unravel in time. "All in all it's a good vest." It looked awful small. Did not think I was going to get it on her. It fit. Could have been a little longer. All in all it's a good vest. Steve and Dixie. The vest is great. The only drawback for me is the zipper is a little hard to fool with in the cold after it gets wet. I would prefer just the velcro of a stronger type. "These vests do not fit my dogs." These vests do not fit my dogs. "He does not look right in it. It fits like a girdle. I can't rate it fairly." My dog is too big for any of the vests on the market, 106#. He does not look right in it. It fits like a girdle. I can't rate it fairly. "A little lighter than I thought and doesn't fit at all." A little lighter than I thought and doesn't fit at all. Ripped first hunt. Stitching came loose. Waiting for new one. "Fits good around chest, but super loose around neck." Fits good around chest, but super loose around neck. I bought one for each of my dogs for duck hunting trips and used them two days in a row. The second day one of the vests started to come apart at the seams, and I finally had to take it off the dog. I just think that the sewing needs to be reinforced on this brand of vest. However, I called Gun Dog Supply and told them about my issue, and they rectified the issue by sending me another new vest to try. I have owned other dog hunting vests and come to the conclusion that they really only last a year or two if your dogs hunt a whole lot...like mine do! So this one that separated kinda threw me for a loop, when it basically only lasted the two days. Might have just been a bad apple coming out of the factory. "It had loose thread around the zipper and upon pulling it a little tore real easy." Received it. It had loose thread around the zipper and upon pulling it a little tore real easy. I got a sewing needle and reattached it. Since that time it seems to be holding up well. The first time I used it, he had some small amount of irritation on the front legs from rubbing where it bends on the jacket. I felt it wasn't a big deal. It was small, but he came back from hunting today, and his front legs are all raw, inflamed and sore, and all the hair is worn off of the areas all the way down the upper part of his leg. I think I need to find him a long sleeve t shirt to wear until it heals or he will continually lick it. I was going to put a shirt under it. but the sleeves were not long enough. It got a lot of good reviews, so I tried it, but feel bad that it did this too him. So I just wanted to make people aware that this is a possibility, especially with short haired dogs. Thanks for your time. I have a very small lab. I purchased the smallest size I could find. After using it for two days, I discovered that the vest had rubbed raw spots under her front legs. In fairness to the product, it could be because my dog is so small. You cannot leave these on your dog for any length of time. Condensate builds up underneath the vest and actually makes them colder not warmer. I will be returning all of these for a refund. I returned this vest for a full refund. After using the vest 2 or 3 times the stitching came apart, and the vest was coming apart. Already came undone. Piece of junk.